A darkened chamber enveloped by three corridors. 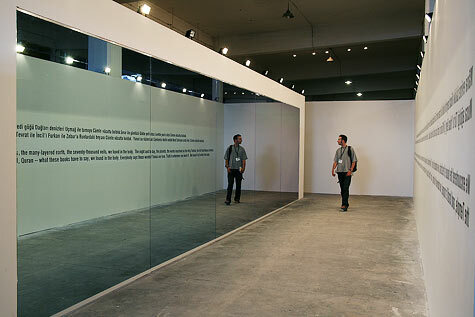 The mirror is reflecting a thirteenth century Turkish poem from the Sufi poet Yunus Emre. In the darkened chamber visitors are presented with both the Turkish text on the wall and those in the midst of reading the text on the mirrored surface. * 1956 Vancouver, Canada; lives there.